Grand Cayman hasn’t earned its moniker as the culinary capital of the Caribbean without creating some iconic restaurant dishes along the way. The island has hundreds of dining destinations, and many of them have signature dishes that keep customers coming back over and over again. 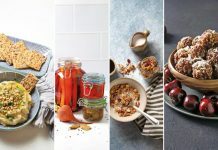 Writer Laura Durston rounds up some of the signature dishes you simply must try. It may not be strictly a ‘dish,’ but this meal in a glass certainly deserves its spot on our list of iconic restaurant offerings. Legend has it that in the 1970s a thirsty guest asked the Wreck Bar bartender for a White Russian, which, as any cocktail enthusiast knows, is made of vodka, Kahlúa and heavy cream. Being without heavy cream, the inventive barkeep simply used Irish Cream instead, and thus an icon was born. 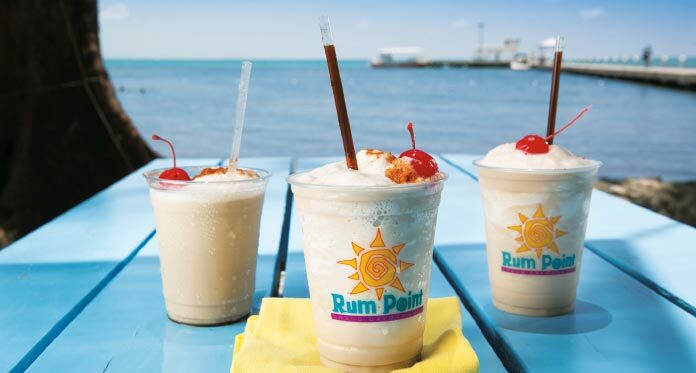 Many variations of the mudslide now exist in Cayman, but Rum Point Club sticks to the original of vodka, Kahlúa, Irish Cream and ice. No chocolate, no ice cream, no whipped cream. Just a sprinkle of cinnamon and a cherry and, of course, a shot of Kahlúa in the straw. 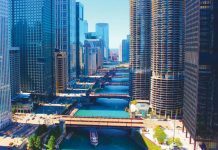 Some websites do give the Wreck Bar the credit of inventing it, and the Kahlúa website at least mentions the Cayman Islands. We wonder if that industrious bartender knew he was creating an iconic drink that would still be knocking the socks off locals and tourists 40 years later. Nestled down Sound Way off North Sound Rd., Welly’s Cool Spot needs no introduction to lovers of local fare. 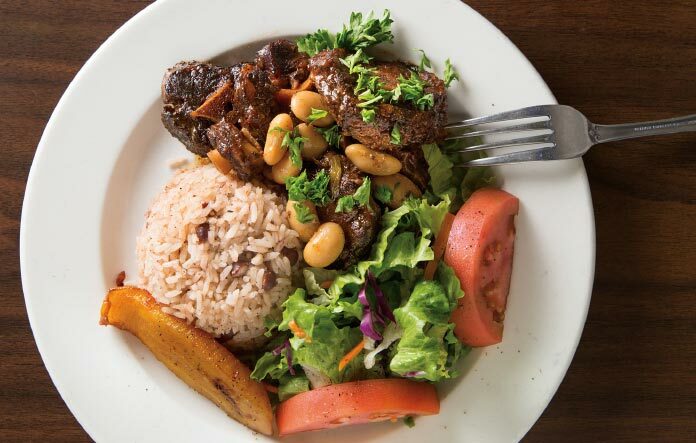 Serving authentic Caribbean dishes, there’s no risk of you leaving Welly’s hungry, and one dish in particular that regularly pops up on ‘must have’ lists is the oxtail. Beef oxtail is a local favorite, marinated with island spices and slowly cooked until it reaches the ideal level of tenderness. It’s served with white rice or rice and beans, local plantains or side salad. Oxtail has always been a Jamaican staple and with a resurgence of ‘nose-to-tail’ dining over the past decade its popularity has only grown. But no matter how many oxtail dishes famous chefs turn out, it’s the original recipes such as Welly’s that keep customers coming back for more. As the name suggests, the Cracked Conch restaurant in West Bay is one of the best places to have a quintessential Cayman ingredient: Conch. The restaurant has been serving a Conch Platter for over 30 years and to this day it remains a menu favorite for many patrons. 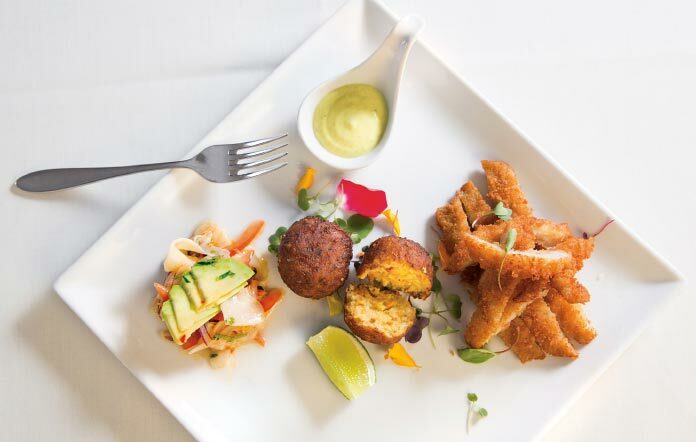 The platter combines Conch Ceviche, Conch Fritters and Cracked Conch, allowing diners to try three styles of the marine mollusk. The ceviche portion is made by thinly slicing conch, avocado, tomato, red onion and cilantro before mixing and chilling with a marinade of scotch bonnet vinegar, lemon juice, chili and salt, creating a fresh and zingy result. For the fritters, ground conch is mixed with vegetables, seasoning and flour, formed into bite-sized balls, fried until golden brown, and served with homemade jerk mayo. And last but certainly not least, the eponymous Cracked Conch is made by slicing the conch lengthwise before tenderizing, breading and frying until golden brown. It is served warm with tartar sauce for dipping. 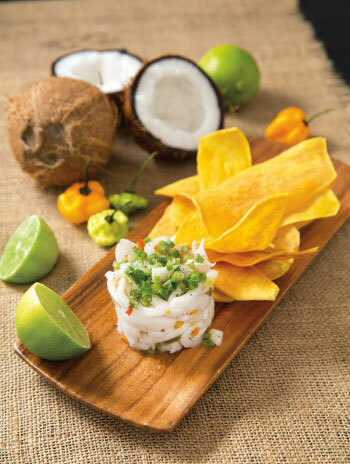 Coconut ceviche is a definite ‘must try’ when visiting Cayman Cabana in George Town. The plant-based ceviche is perfect as a light, healthy appetizer on a balmy summer night. Young, delicate coconut meat takes the place of fish in this dish and it’s a beautiful substitute for the real deal, with the texture resembling a traditional seafood ceviche. The fresh and firm coconut meat is loaded with a big dose of fresh citrus juice, seasoning peppers, Scotch bonnet and Cabana’s blend of special herbs and spices, served with house-made sweet potato chips. Even hardened meat eaters can’t argue that this ceviche is tasty, refreshing and satisfying. Number one on many restaurant aficionados’ list of must-eats is Calypso Grill’s Sticky Toffee Pudding. There are other versions on-island, but according to the masses this one is the cream of the crop. The creation of award-winning chef and Calypso co-owner George Fowler, the pudding is impossibly moist and light, and smothered in sticky sauce. This quintessentially British dessert has become a firm favorite with residents and tourists alike, who always save space to enjoy a portion on Calypso’s breezy deck overlooking the North Sound. Thanks to our close proximity to and historical relationship with Jamaica, Cayman has several excellent jerk offerings. From Sam’s on Eastern Avenue to Peppers on West Bay Road to the Red Bay drums that pump out smoke weekly, we’re spoilt for choice. One man who has been providing jerk to the masses for nearly 40 years is Mr. Seymour Silburn. 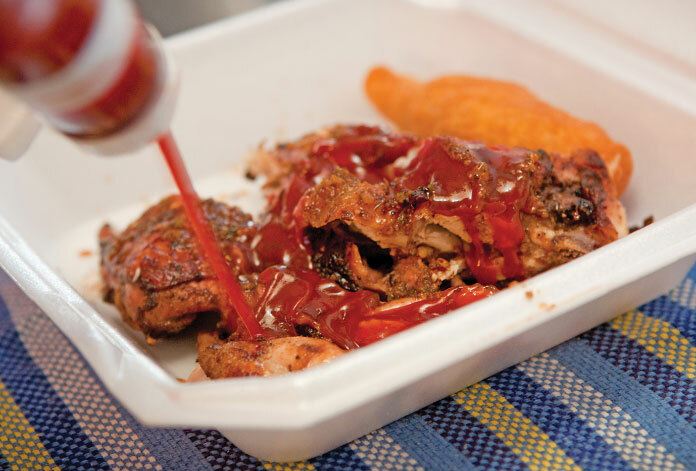 Seymour’s jerk stand has graced many locations over those four decades, including a long stint on Shedden Road, the waterfront in town and Public Beach; its present home is in the Tortuga Rum factory complex on North Sound Road. While the location may have changed, his jerk remains the same – mouth-wateringly good, expertly seasoned and cooked over a charcoal grill. Seymour’s offerings have an army of fans, willing to follow him wherever he sets up shop. 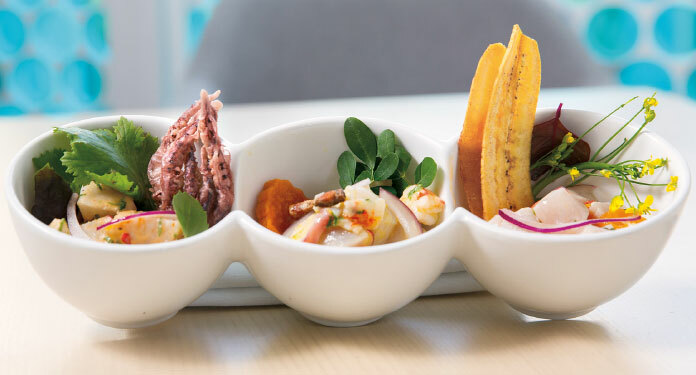 Agua Restaurant is practically synonymous with fresh ceviche – you can’t visit their new Camana Bay location without giving it a try. Taking full advantage of the excellent daily catch that our Caribbean location affords, Agua offers six styles of ceviche: Clasico (fresh catch, seasoning pepper, cilantro, sweet potato and cancha), Cayman Style (fresh catch, tomato, orange, seasoning pepper, Scotch bonnet, cilantro, plantain), Aguachile, Nikkei (Tuna, yuzu, tamarind, soy, cilantro and cancha), Thai Style and Mixto Peruano. Customers can also order a trio of any three styles, if it’s too hard to choose. 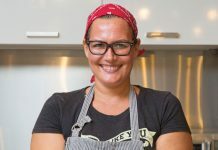 Peruvian chef Antonio Mercado has been with Agua for a number of years and is responsible for making Agua’s ceviche program the success it is today, using a simple but methodical process honoring the South American tradition that it comes from. Fresh local red snapper, rainbow runners, grouper and wahoo are often featured, with cutting styles and seasoning times tailored to the texture of each type of fish. 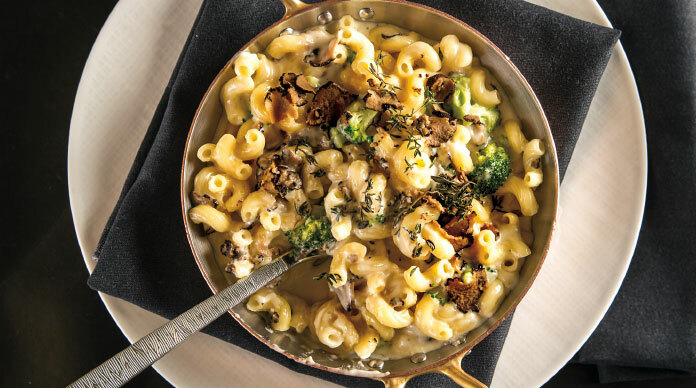 The Truffle Mac & Cheese has been a staple on The Ritz-Carlton, Grand Cayman’s Seven restaurant menu for around seven years, and the recipe has slowly evolved to include a grand total of five cheeses. T he mix of Gruyere, Manchego, Parmesan, fontina and cream cheese makes the sauce extra rich and creamy, yet very balanced due to the different flavor profiles of the cheeses. Slowly blended together with heavy cream, the cheeses are enhanced with truffle oil, and mixed with sautéed broccoli florets and macaroni. Once plated, a garnish of truffle shavings completes the indulgent offering. The richness of this Truffle Mac & Cheese makes it a dish to be savored, and you’ll find it difficult returning to traditional versions after getting a taste of Seven’s version.